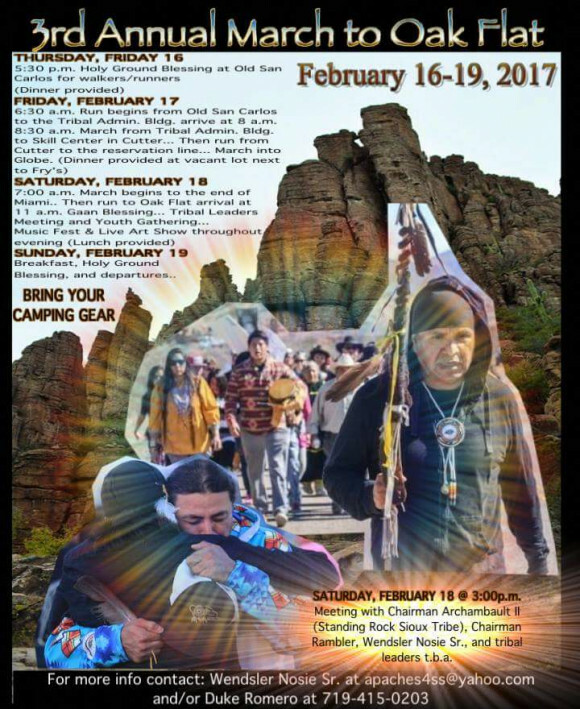 Oak Flat has become another of the recent flagrant abuses of American Imperialism on the body of indigenous nations. The surreptitious insertion of a note in a huge military appropriation bill turned the sacred Apache Tribe land over to foreign mining corporations. It was a masterstroke of political payola. Senator McCain led the greedy pack —and other politicians joined. They have tried to pay back the huge mining corporations for their campaign contributions. They passed a “quick-one” by the human rights community to trash a piece of high desert land that is a traditional sacred site of a small tribe of Apache indigenous people. Instead, the senators ignited a flame. The offensive stab and vicious treatment of the Native Americans by the politicians is a bloody stain that continues to spread. The drums beat the rhythm and prayer singers make the verses of ancient Apache prayers rise from what is known to non-indigenous people as Oak Flat. It is also a part of the powerful Apache Stronghold. This is an established traditional and sacred site. Tribal people from here and far come to dance around the prayer singers amid ancient oak trees. They make evident their resolve to save this beautiful place from total destruction. They are also sternly serious about their resolve to stop the abuse that Indigenous People have suffered for hundreds of years. All people who share a concern for this flame have been welcome to attend the events of these days. A bill introduced in Congress to reverse this travesty is in need of wide support. At the campfire here one meets men and women who emanate the fire of commitment to the growth of better principles of social organization for all of us. There is recognition that a major fault in American national organization can be remedied by adopting more of the basic Native American morals. The morals and principles are thousands of years old. They can be simply put forth as an existence in work of love, humility, and a part of the “mother earth” —not an owner or exploiter of the earth. Unfortunately, these concepts, and potentially this rescue of our human culture, are now considered radical and impractical by most people here in the USA. The for-fathers of the United States borrowed practical ideas from the Native Americans of that time. They took ideas of democracy, representation, cooperation of nations and wrote a constitution, —a great innovation, but not a perfect document. For instance they did not include the progressive status exemplified by indigenous women. Nevertheless, it was an improvement on the European model of monarchy and feudalism. Now, we must go forward and add more to this movement. For instance, we must add human rights ideas, equal roles for women and minorities, and control of the terrible influence of money and corporations in governance. We must do these things because they will help us turn around our damage to our environment, the earth, and save ourselves. 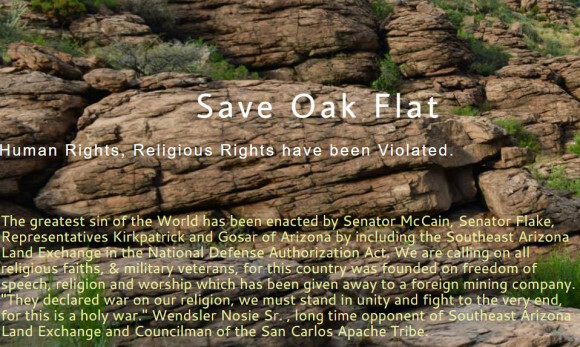 Here at Oak Flat in the mountains of Arizona there is an opportunity to gather momentum toward a new, fair, and just society…and save this beautiful land and ancient oaks from destruction.